Last week I mentioned my squished penny collection. Elongateds, to the hoity-toity connoisseur. Which I was . . . once upon a time. 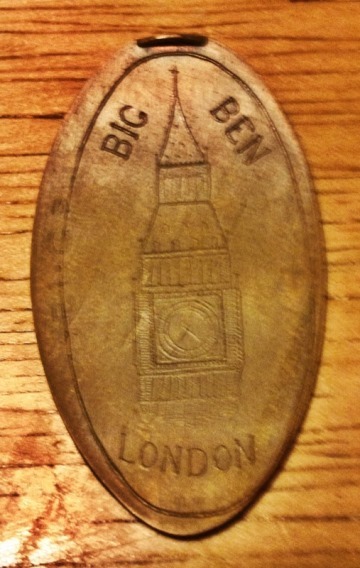 Machines stand all over the world, turning loose change into charming souvenirs. Don’t worry about defacing currency! Penny presses are perfectly legal – in the U.S., at least. U.S. coins if done without fraudulent intent. This law makes it a crime to fraudulently deface currency. Unless you plan on passing off your flattened friend as legal tender, it’s all good. In other countries – like Canada – it’s a crime to deface the images appearing on currency; therefore, they often supply a blank metal alloy disk [more on this later]. 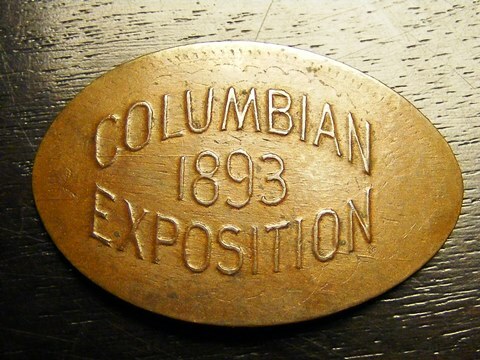 Squished pennies first arrived at the 1893 Columbian Exposition. Fun fact, the fair was supposed to open in 1892 – the 400th anniversary of Columbus’ voyage. This bad boy sells for hundreds of dollars. My personal descent into hoarding copper cents began in the early 90s – no earlier than ’92 and no later than ’94. I know this because that summer my family visited Florida to visit an aunt on my mom’s side. My parents also listened to a timeshare spiel and received family tickets for Sea World. At the time, Sea World had a motion/simulator ride called Mission: Bermuda Triangle. Near the exit to the ride I saw my first pressed penny machine. I wanted one and my parents said yes. Little did they know what they were getting into. That 51¢ opened a whole new world to me – a world of affordable and unique souvenirs. The coin that started it all. Family and friends would bring them as gifts. When dial-up came to our house, I joined some of the very first online trading clubs. Back then they were free. Now, the reputable ones cost money. Money that I don’t have. I found unique coins on eBay. I even found a template used for engraving the dies. Its misplaced right now, but I know it’s around here somewhere. All told, I have around 500 squished pennies and assorted quarters, nickles, and dimes. The mint year is most important. Anything before 1982 is good; the higher copper content should produce uniform coloration. Anything after 1982 is bad; the lower copper content may cause streaking and will oxidize faster. 1982 itself is hit or miss. With practice, you can tell the difference, but I’ve been burned more than once. I avoid 1982 all together. To prove the mint year to a collector, the date must be readable after pressing. Therefore, the date must be on the back of the penny. If the machine is hand-cranked, place Lincoln facing away from the quarters. This has worked for me 99% of the time. In fact, I can’t remember a time it hasn’t worked, but I can’t be absolute. If the machine is automated, it’s hit or miss. I’ll do a test run with my least desirable design and go from there. 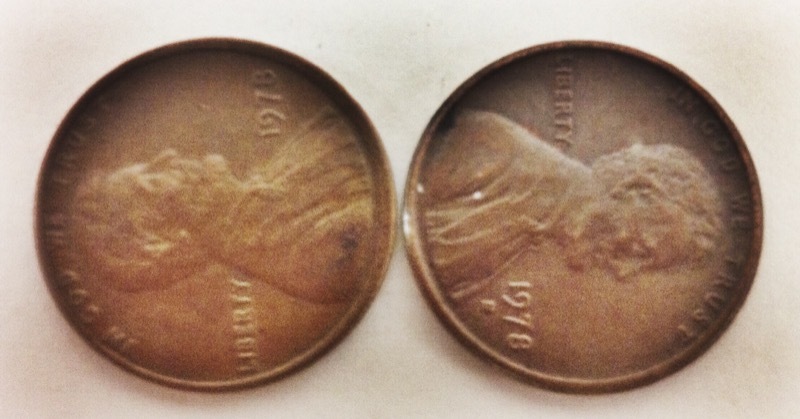 Everyone wants shiny pennies, but pre-82 pennies in that condition are rare, expensive, or both. I find that a mix of copper cleaner, ketchup (Heinz preferred), and vinegar does the trick. The downside is that the press often destroys the original image – including the date. Nail polish to the rescue! 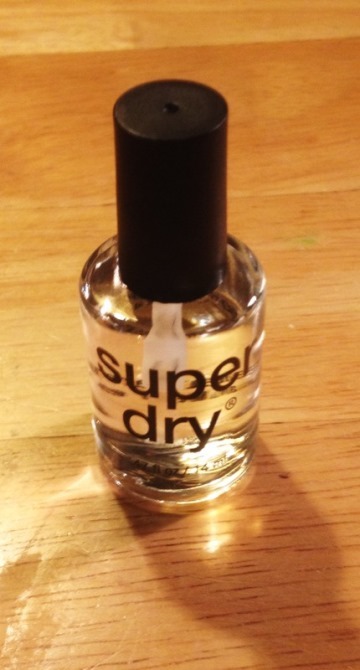 Simply coat the date side with clear nail polish and let dry. 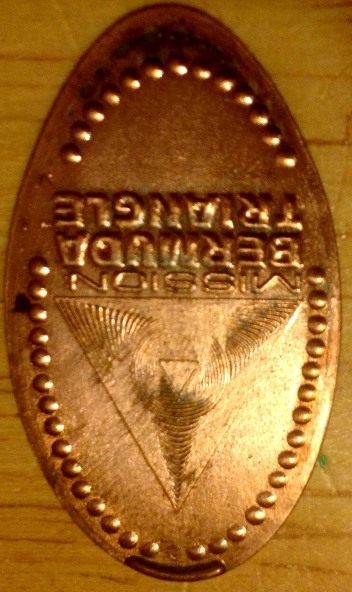 When the penny presses, the date will be clearly visible. Coating the penny after pressing will also prevent oxidization and discoloration. For a time, the collection container mattered: certain plastics would interact with the pennies and cause corrosion. 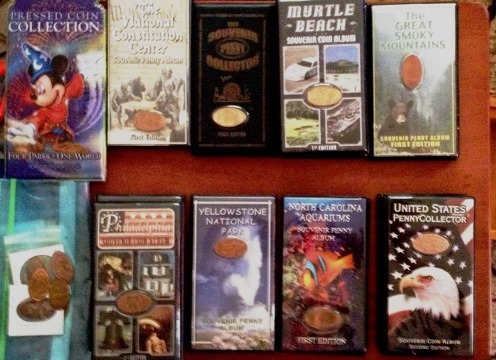 Now, nearly all souvenir books on the market are safe to use. I still collect squished pennies and I’m still willing to trade. Of course, if you just want to send me one that’s cool, too. 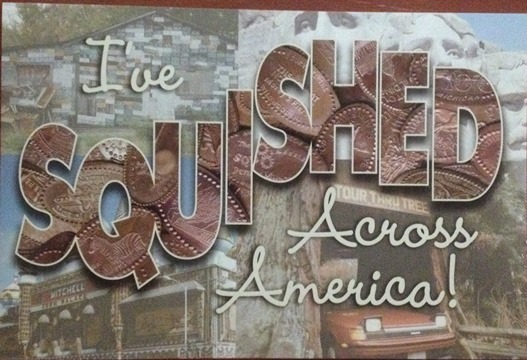 There was even a Squished Penny Museum, to which I was a proud contributor. Check out PennyCollector. I’ve been using them since they started. Or, you can always ask me in the comments! Very cool. At one time Oak Ridge visitor center used to have encased pennies that were radioactive….as a kid I squinted a bit at that …if they had duck and cover drills and bomb shelters to protect people from radiation..how’s that little plastic cover going to do it’s job? Following that concept, should everyone wear raincoats in case of attack? The only mashed pennies we had were from train tracks…but parents/adults screamed not to do that as the train might derail….